Gold producing areas in Utah mentioned in text. Geologic processes concentrate gold into two principal types of deposits: lode (or primary) deposits where gold is deposited by gold-bearing solutions within rock formations; and, placer (or secondary) deposits where gold-bearing rocks are eroded and the free gold is concentrated in stream beds. Most prospectors began their search for gold by looking for placer deposits because they offered quick returns with simple equipment. The discovery of placer deposits often led to the discovery of lode deposits. In Utah, primary gold deposits have proved to be more economical than placer deposits. In 1847, the primary influx of Utah pioneers, Mormon settlers (members of the Church of Jesus Christ of Latter-day Saints), arrived in Salt Lake Valley. Unlike settlers in other western states who prospected for precious metals, early Utahns concentrated on farming, raising livestock, and establishing communities, and only mined materials necessary for home industries such as salt, coal, lead, and sulfur. Therefore, it wasn’t until 1858 that a gold discovery was reported. Westbound travelers on their way to California found gold at Gold Hill in Tooele County. Native Americans initially drove away prospectors, discouraging any mining in the area. Prospectors were persistent, however, and in 1869, the Clifton (Gold Hill) district was organized. Small amounts of gold, silver, and lead were produced over the next few years. Mining activity and production increased in 1892, when a mill was constructed to treat the ores. General Patrick E. Connor, stationed with his regiment at Camp Douglas in the foothills east of Salt Lake City, and others formally organized the first mining district, West Mountain (currently Bingham) in 1863, after the discovery of lead-silver ore in Bingham Canyon in the Oquirrh Mountains of Salt Lake County. Placer gold was discovered in Bingham Canyon the following year. These placers were the largest and most productive ever discovered in Utah, yielding about $1.5 million in gold. However, they were practically depleted by 1900. A gold placer in the Mercur (previously Camp Floyd) district in Tooele County was discovered in 1870. A few prospectors staked claims but soon abandoned their endeavors due to the scarcity of both water and gold that could be panned. Silver ores kept the district alive until around 1880. About 1883, gold-bearing ores were found, but the gold could not be separated from the rock. Disappointed, prospectors again left the district. Then, in 1889, these ores were rediscovered and the gold successfully recovered using the newly developed cyanide leaching process. From 1890 to 1900, almost 2 million tons of gold ore were treated, producing over 380,000 ounces of gold worth about $8 million. In the 1880s, Bluff residents intermittently prospected the San Juan River and its tributaries. In 1892, exaggerated tales of the area’s fabulously rich river placers and sandstone terraces spread like wildfire throughout the West. A stampede of 1,200 prospectors followed, creating the “Bluff excitement” in the winter of 1892-93. After enduring hardships, much fighting, and some bloodshed, the prospectors discovered that the gold was very fine grained, making recovery difficult, and in a few months the area was practically abandoned. In the late 1800s and early 1900s, gold placer mining was conducted in the Tushar, Henry, La Sal, and Abajo Mountains and along the Colorado, San Juan, and Green Rivers and their tributaries. Early gold-producing districts, some mining gold as a by-product of other metals, included Tintic, Bingham, Mercur, Park City, Gold Mountain, Gold Springs, State Line, Clifton, Park Valley, Spring Creek, American Fork, and San Francisco. During these early years of discovery, thousands of claims were filed and many mines started. Eventually most of these were either mined out and abandoned, or were consolidated and worked by large mining companies. Gold production declined and many gold mines closed during World War I (1914-1918) due to a shortage of manpower, decreasing ore reserves, and increasing costs. During the depression in the early 1930s, gold mines were brought back to life and prospectors thoroughly searched the known and little-known gold-producing areas. Gold production increased rapidly when the government-regulated price of gold was raised in 1934 from $20.67 to $35.00 per ounce. This interval of increased productivity ended during World War II when gold mines were closed in 1942 by the War Production Board and were not permitted to reopen until the war ended. By-product gold, such as the gold recovered with the copper ores in the Bingham mining district, accounted for most of the gold produced during the war. 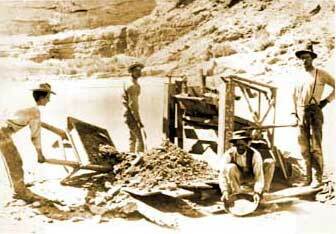 After the war, some gold mines remained closed due to the fixed selling price and rising operation costs. The active Utah gold-producing areas at this time included the Bingham, Cottonwood (Big & Little), East Tintic, Gold Mountain, Mt. Baldy, Ophir-Rush Valley, Park City, Tintic, and Willow Springs districts, and the Notch Peak (in the House Range) and La Sal Mountain placers, although some only operated intermittently or produced small amounts. In 1968, gold’s fixed price of $35 per ounce as a commodity was terminated and its price increased, reaching more than $1800 per ounce in 2011. From 1982 to 2005 the price remained in the range of $250 to $500 per ounce. Since then it has ranged from $600 to $1800 per ounce. Major gold developments in the 1980s and 1990s included operations in the Bingham, Mercur, Goldstrike, Tintic, and East Tintic mining districts. Exploration and development continues in Utah today. Old mining districts are being re-explored and in some cases, revived using new technologies.